Even the most ardent death metal fan, at least those used to a more traditional and old school variety, must bow down to the unbridled ferocity of a HATE ETERNAL show. Erik Rutan's brutal juggernaut is not for the faint of heart, as this June 4, 2006 show at The Garage in London proves. If you're looking for one of those overly polished, larger than life productions, look elsewhere. 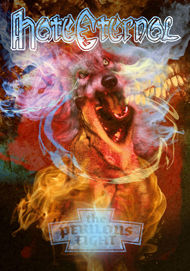 "The Perilous Fight" is three guys on a stage with dark lighting setting off death metal daisy cutters in a club full of fans that would expect nothing less than the bringing of pain. That said, the camera work is just fine, and includes a slew of close-ups. Rutan stands tall as one of death metal's true warriors, firing off round after round of hot, leaden riffs, and roaring above it all like a man possessed, his stage front partner Randy Piro strafing the crowd with low-end firepower and matching Rutan bark for bark and scream for scream. Replacing drum god Derek Roddy for the European tour is the more than capable Reno Kiilerich. Rutan's rather unusual solos actually come off better in a live setting as well. The 12-song set includes five tracks from the considerably more diverse "I, Monarch" ("Two Demons", "Behold Judas", "The Victorious Reign", "To Know our Enemies", "Sons of Darkness") and fits nicely with classic bludgeoners like "The Powers that Be", "King of All Kings", and "Dogma Condemned". The occasional between-song tribal instrumentation piece is thrown in to give the crowd time to catch a breath. The bonus material is lively and entertaining. Aside from a standard backstage interview with the band members, the real treat is a segment called "Behind the Scenes at Mana Studios". A tour of Rutan's original in-house studio and the official Mana Studios includes Rutan's detailed discussion of all his equipment, as well as a commentary on many of the bands that he has produced over the years, including his own. The DVD ends with a home video collage of road shenanigans. As one would expect, the DVD also features videos for "The Powers that Be", "I, Monarch", and "The Victorious Reign". Nothing fancy here, but easily a required purchases for HATE ETERNAL fans.